Which you thoroughly enjoyed. On Saturday we stomped about for a while, you did a bit of naked swimming in the fresh-flowing creek, we walked and looked at the co-op vege gardens, and generally watched the rain fall, listened to the whip birds and had a great relaxing time. And after breakfast this morning we did a bit more stomping through the rain. 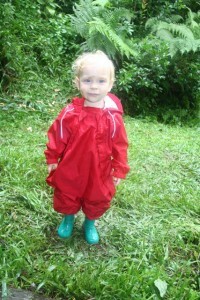 You were suited up in your Canadian-purchased Mountain Equipment Co-op full body rain suit and hand-me-down-galoshes (thanks M & B & Co)… So all good, we thought. However, given that it was raining, the leech to human attack ratio was very high. attached to your gum, INSIDE your MOUTH. Oh yeah, you heard right. Gross! P.S. and yeah, I would have taken a photo except I would have had to drag you back up to the hut through the grass, leech still attached etc, in order to retrieve the camera. We figured it was a situation best dealt with immediately. P.P.S. And for those of you who have never experienced the joyous experience that is having an Australian blood-sucking leech stuck to you and having to remove the darn thing by pulling it off, it’s something that is so gross that despite years of bushwalking and experiencing leeches I just can’t get over my feeling of digust over… So welcome to that world, O! Oh Dear God, NO! Oh, wow. That is one for the books. Yep..I’m not going to forget it quickly!